Are people who prefer their steaks well done just wrong? It’s the question that has divided a nation that is otherwise firmly united on the “steak is great” front, given that we Americans consume about 25 billion pounds of beef annually. It makes ordering at steakhouses for large parties a negotiation; it causes effete elitists like me to reconsider the measure of a diner; and I’m going to guess that the BTUs of gas spent taking perfectly good rare steaks to well done amount to an environmental catastrophe. There are serious differences in how people order different cuts, and we wanted to know why. Prime rib also works great on the rarer side. Because it’s cooked slowly and at low temperatures, a rare order of prime rib can come out without the bloodiness that turns off many rare-averse people. Other steaks can handle more heat. Dahlmann suggests that home cooks invest in a high-quality meat thermometer to nail the perfect doneness every time. Any steak with an internal temperature from 95 degrees to 105 degrees Fahrenheit is rare, anything from 115 to 125 degrees is medium-rare and, according to FiveThirtyEight culture writer and cantankerous elitist Walt Hickey, anything above that is ruined. From May 30, 2016, to May 21, 2017. Of course, Longhorn’s customers may not be representative of all Americans. 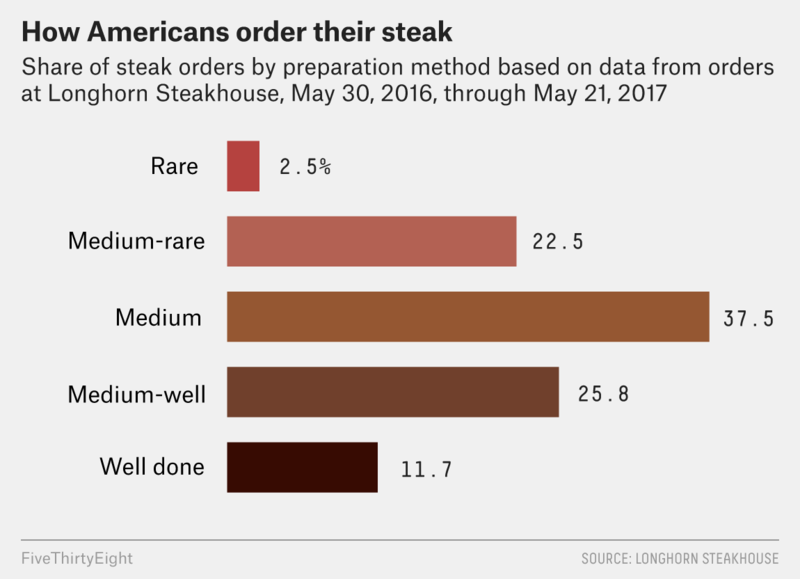 But Longhorn is one of the biggest steak-focused chains in the country, so it’s probably pretty close.